It's 00:01 in Gladstone, USA right now. I-205 at Gladstone A view of the current traffic situation on the I-205. West Linn, Oregon: Trillium Creek Primary School, 3.2 miles away. West Linn, Oregon: Lowrie Primary School, 3.2 miles away. Sunnyside, Oregon: I-205 at Sunnyside, 3.5 miles away. 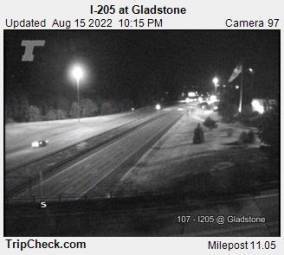 Clackamas, Oregon: I-205 at ORE212 -224, 3.8 miles away. Lents, Oregon: I-205 at Foster, 6.3 miles away. Portland, Oregon: Rodgers Marine LLC, 10.1 miles away. Portland, Oregon: I-205 at Government Island, 10.1 miles away. Parkrose, Oregon: I-205 at Killingsworth, 11.8 miles away.